If you are living with a medically diagnosed food allergy or intolerance, Penn State Campus Dining is here to help! We take food allergies and intolerances very seriously and offer multiple resources to help guests dine safely. 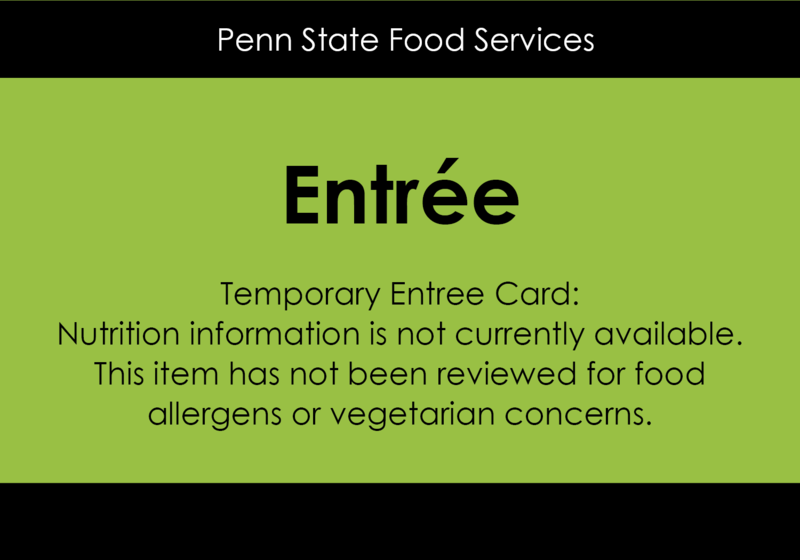 Within the dining commons, helpful allergen information is displayed on individual entree cards placed in front of each menu item. Each entree card will identify if major allergens, including dairy, egg, fish, shellfish, peanuts, tree nuts (including coconut), soy, wheat/gluten and sesame, are present in the dish via individual icons. Guests can also use the online menu to search for allergen, ingredient and nutrition information. For assistance with accessing allergen information for online menu items, please click here. Campus Dining recognizes that allergic reactions can occur to foods outside of these common allergens, so if you have an allergy or intolerance to any food, you're encouraged to contact foodallergies@psu.edu for additional support and resources. Although our chefs adhere to standardized recipes, sometimes last minute changes to a recipe may occur before service, which may affect the allergen or nutritional information. In these instances a temporary green entree card will be placed to alert guests that the recipe has not been reviewed for allergen or special dietary concerns. If you have food allergies or follow other special dietary restrictions, please use caution before consuming a food with a temporary entree card and seek assistance from a staff member if you have questions about ingredients. They will be more than happy to help you! Starting in Fall 2017, The Commons at East Food District will now offer a station that is free of common food allergens including dairy, eggs, peanuts, tree nuts (excluding coconut), fish, shellfish, soy, wheat/gluten, and sesame. The station includes a separate kitchen and cooking equipment and is full service to prevent allergen/gluten cross-contact. To view the dining hours of PURE, please click here. 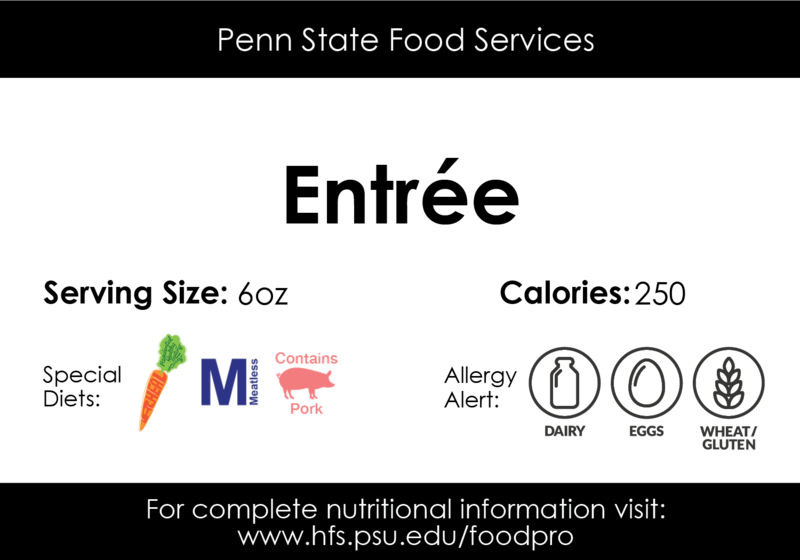 Penn State Campus Dining makes every effort to label food allergens; however manufacturers may change their product formulation or consistency of ingredients without our knowledge and product availability may fluctuate. Please be aware that food items are prepared in a shared kitchen and do pose a risk for cross-contact. Therefore, it is ultimately the responsibility of the customer to judge whether or not to question ingredients or to choose to eat selected foods. Food allergic guests must be their own advocates and exercise caution at all times. Customers who may need to use an Epi-Pen should carry their own while dining. Penn State Campus Dining will not assume any liability for adverse reactions of foods consumed or for any cross-contact that can and inevitably occurs within a self-service venue. If you have any questions regarding ingredients, please consult the registered dietitian(s) or a dining services manager.